Free Shipping Included! 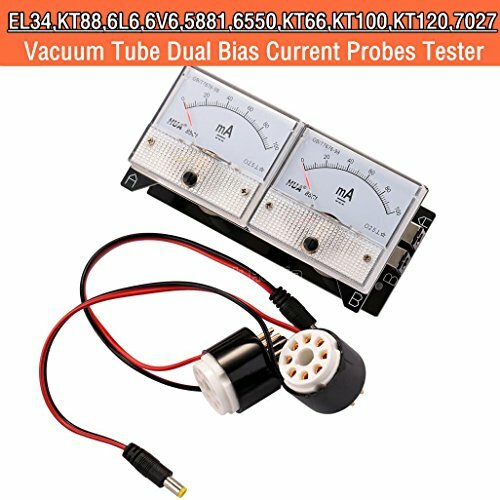 Nobsound 8-Pin Dual Bias Current Probes Tester Meter for EL34 KT88 6L6 6V6 6550 Vacuum Tube Amp Amplifier by Douk Audio at movies-out.com. MPN: GFJ479_New. Hurry! Limited time offer. Offer valid only while supplies last. How to use it? Turn off your amplifier.Connect the product. Remove the power tubes and Insert the power output tubes into the bias probe sockets. Turn off your amplifier.Connect the product. Remove the power tubes and Insert the power output tubes into the bias probe sockets. Then Insert bias meter probes into the tube sockets of the amplifier. Turn on your power amp and let the tubes get warm about 5 minutes.Read the bias measurement. Current meter "A" is reading "A" input, and the Current meter "B" is reading for "B" input. If the both reading is same.That's perfect. If two reading is different. Should be no more than 2 or 3 milliamps difference for a good balance between the tubes. This product can measure the cathode current of power tubes to get its bias current at low voltage side. It is suitable for EL34,KT88,6L6,6V6,5881,6550,KT66,KT100,KT120,7027.